Koji Igarashi’s hustle to make a new Castlevania-style game has paid off: his spiritual successor to a series Konami keeps screwing up—because Konami is Konami—has in less than 24 hours made over $1 million on Kickstarter. Bloodstained was only asking for $500,000, so to have doubled that in one day means they’re on track to make a lot of money. 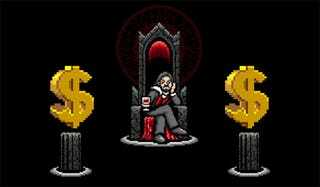 That kind of cash has already unlocked all kinds of stretch goals, from David Hayter voice work to extra characters, but it should be noted that this isn’t the only money Bloodstained is getting. So if you’re wondering how “only” $500,000 was going to get a PS4/XB1 game pressed and distributed on physical discs, that’s how (it’s also going to be on PC, but whatever, Steam).